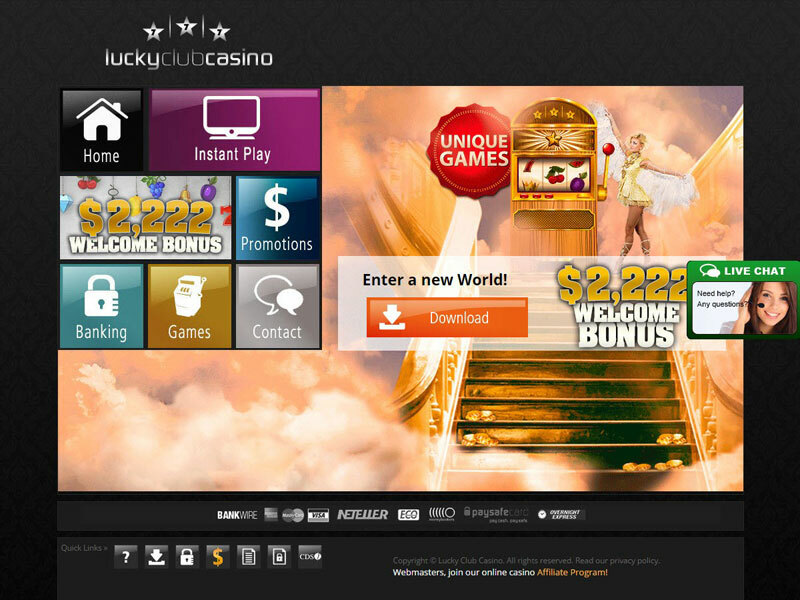 CasinoBonusNews → Casinos → "Lucky Club Casino review"
Lucky Club Casino asks its visitors to enter a new world, one which is filled with rich prizes, streamlined gameplay and games galore. Visitors from around the globe, including the United States, are getting used to the idea that they may get lucky just by stepping in the door and checking out this new casino’s promotions and games. Being a part of the brand new NuWorks software platform certainly ought to instill players with confidence as well as luck. Does a $100 welcome bonus sound lucky to you? 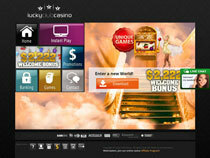 New sign-ups can earn up to a bonus $100 by collecting on a 100 percent welcome bonus on the first deposit, up to $100. Then players can add to their bankrolls by using up the bonus codes for Lucky Thursday, a 50 percent deposit bonus for all deposits up to $200, advertised as being just the thing to boost your weekend. Or, there’s the current Lucky Reward monthly bonus, giving players a 100 percent matching bonus on all deposits up to $200. Do Mondays get you down? Lucky Club has a Monday bonus that promises to cheer you up: A no-deposit bonus based on how much you have deposited and played all week leading up to Monday. 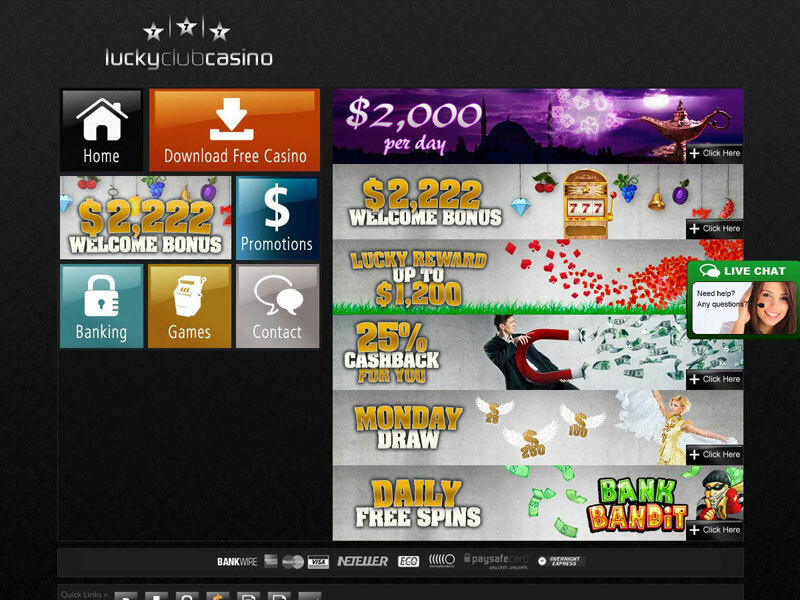 Lucky Club Casino boasts to currently having 37 games. This may not sound like a lot, but for some players it’s all about quality, not quantity. This online casino is able to give its attention to each game, which ensures that the payout percentages and customer satisfaction remain high. The casino hosts the most popular table games like baccarat, Tri-Card Poker, Let ‘Em Ride or blackjack. Gamblers who like their video poker can ante up with traditional versions of the game, or get far, far into the action with video poker machines that deal out up to 100 hands in a single play. Then, players can wonder off to the selection of video slot machines, like the so fun it’s scary Monster Millions, which has a feature guarantee, which means after a special number of spins, if the bonus round hasn’t popped up, it certainly will. This feature is also available on other machines, like Carnival Cash, which also gives players a chance at its progressive Clown Jackpot. Some of these new slot machine titles even offer up not one, not two, but five random progressive jackpots. Creating an account is as easy as downloading the free software, choosing your username and password, and then heading over to the cashiers tab to make your first deposit. 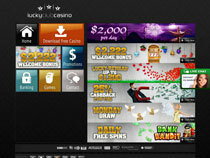 Lucky Club Casino accepts several payment methods: NETeller, ECO Card, Moneybookers, credit cards, uKash, MyPayLinQ, InstaDebit, PaySafe, Click2Pay or money transfers. To claim your hard-earned winnings, you can use reloadable debit cards, MoneyBookers, NETeller, uKash, Overnight Express, ECO Card, InstaDebit, Click2Pay or wire transfers. Lucky Club is not only on the cutting edge of gaming technology, but it is also on the cutting edge of customer support and technical help. Not only does the casino website offer the usual –yet tried and true—methods of assisting customers, like live 24/7 chat support, toll free telephone support or help through Email, but it also offers tech savvy players assistance through Skype. So even though this newcomer to the online gambling world is still getting its lucky ducks in a row, players can be confident through its software and pedigree that it is no fly-by-night casino.